For more than a year students and employees of MSU fought for the FIFA World Cup 2018 fan zone relocation away from the Sparrow Hills and MSU Park. 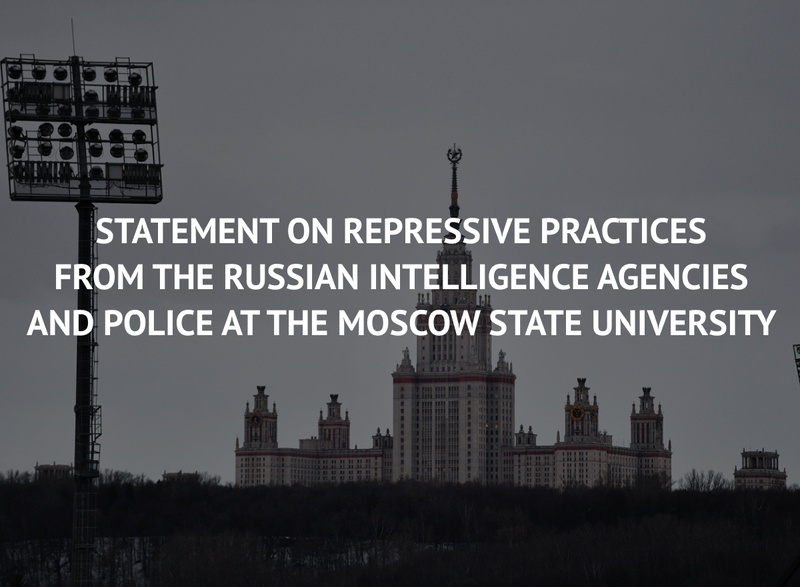 This situation that Moscow University got dragged into due to the commercial interests of country’s authorities shed a light on unacceptable practices usually hidden from the public eye of the University community. We haven’t written a lot about them, trying to focus on the main goal of our campaign, but now it’s time to address this issue. We openly say: MSU for quite some has an abnormal, unhealthy and dangerous coalescence of administrative tops, local police station and intelligence officers ‘assigned’ to the University. This symbiosis has been silently damaging our University for many years, but this time their overstepped ethical boundaries so many boundaries, that we believe we have to disclose the long-time history of their activities. 1. University Police station for years have always been informally involved with the administration: there have been cases where activists were detained by police following direct orders or leads from the rectorate. 2. FSB (KGB successor) and other Federal agencies have ‘assigned’ intelligence officers working directly with the rectorate. Formally they hold different administrative positions: assistant to the rector, deputy head of housing, and others. 3. In Moscow State University, just like in many other Universities, they are usually bored and busy with irrelevant tasks and occasionally play a role in University internal power games supporting clans on influences. They do not have and can not have any kind of ‘superior mission’, that would justify their existence within the University. 4. As former intelligence officers, they collect intel and compromising materials on University administration that they convert into personal influence. 5. University intelligence officers for many years have been turning students and employees of the University into their whistle-blowers and provokers. 6. During our relocation campaign, University executives were not ashamed to use paid publications, hack activists’ accounts, impose anonymous threats, surveillance, and pressure on relatives. Detained first-year students accused of damaging the ad poster is also one of the results of the repressive system. We are to consistently publish all the facts we managed to gather in regard to the repressive practices mentioned — we will devote our time to publish posts in the nearest future about that. Our end goal is to stop these practices, that poison l life in the University and in the following posts we will uncover the details of each bullet point mentioned in this post. The Fan Fest will be placed right next to the Moscow State University. Unfortunately, there’s no point denying that – the construction is well underway, the territory is fenced, more plans are published and to be realised. 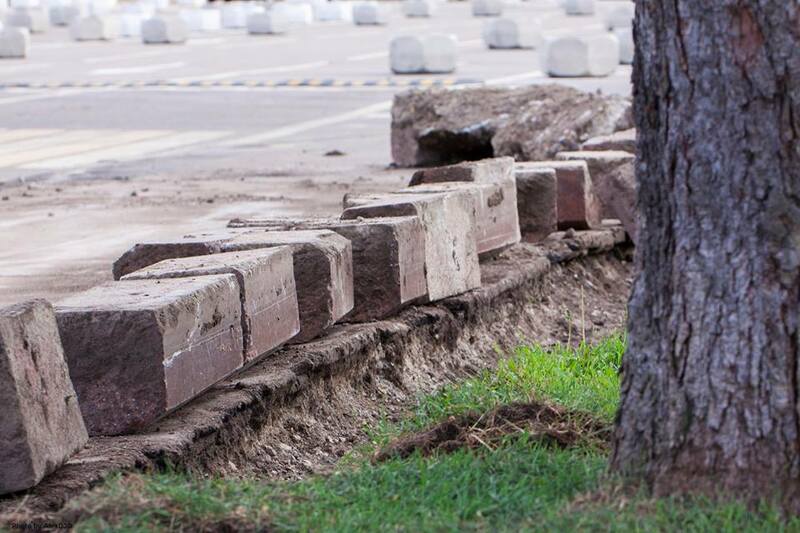 Moving the Fan Zone to another location – that we fought for – is now almost impossible. Despite the outcome, we do not believe we lost this campaign. We have been able to enunciate, in public space, the opinion of a large part of the MSU community, bringing it to the administration of the University and officials at various levels, escalating the information about internal and external problems of the university that usually was hidden from the public eye. During the year, a large number of people were fighting for the relocation of the fan zone: students, alumni, and professors stood up for the interests of the University, openly disobeyed treacherous managers and their decisions. From the beginning, we have been facing an aggressive response from the University administration and city authorities: the blockade of the 9th floor to let the Rector play “Hide-and-seek” with students, many refusals on public events organization, illegal detentions during the leaflets’ handouts, fake reconstructions and general cleanings, police buses on the territory of MSU. And, of course, a gross, outrageous pressure on campaign activists organized by the MSU administration, which is likely to continue, and which we will write more about. We continue to believe that the fan zone on the Sparrow Hills harms the University and the environment around it – we have not been convinced by fake promises and pseudo-compromises. In the current situation, when the relocation can only happen by a miracle, we have a simple but very important duty: to closely monitor the entire process of construction and works for the fan zone, detect violations, monitor all shady activities of officials and contractors. 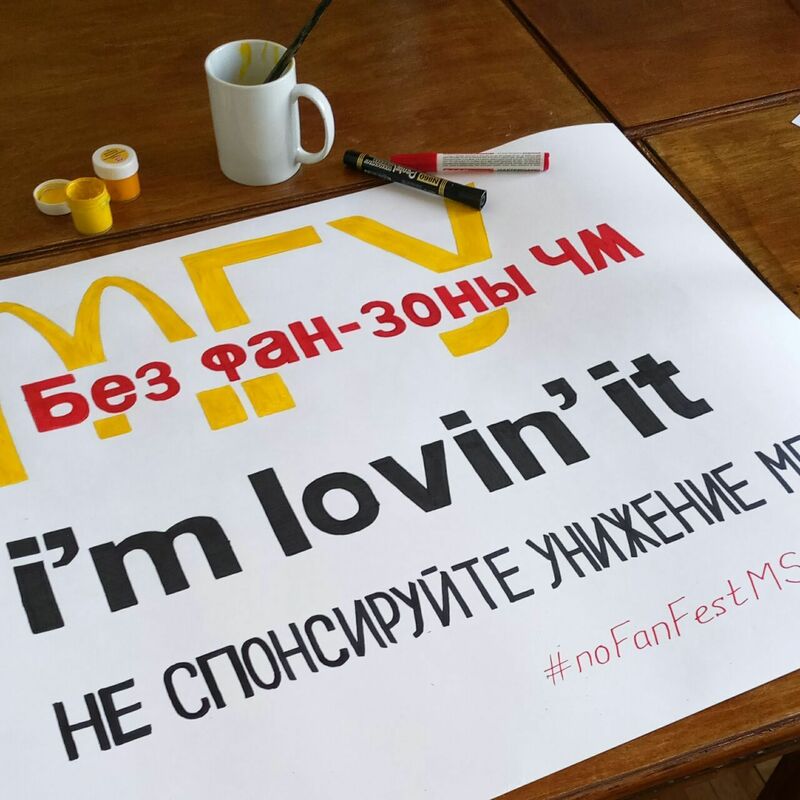 And we ask you to do that with us: follow the fan zone activities, take photos and videos of everything that violates the laws or promises given to us by the MSU administration, Deputy Prime-Minister Arkady Dvorkovich and city officials. These records later will help us to assemble the full picture of the consequences of the fan zone, which will be an excellent illustration argument in the fight against future attempts to host events like this on our campus. We do not surrender. 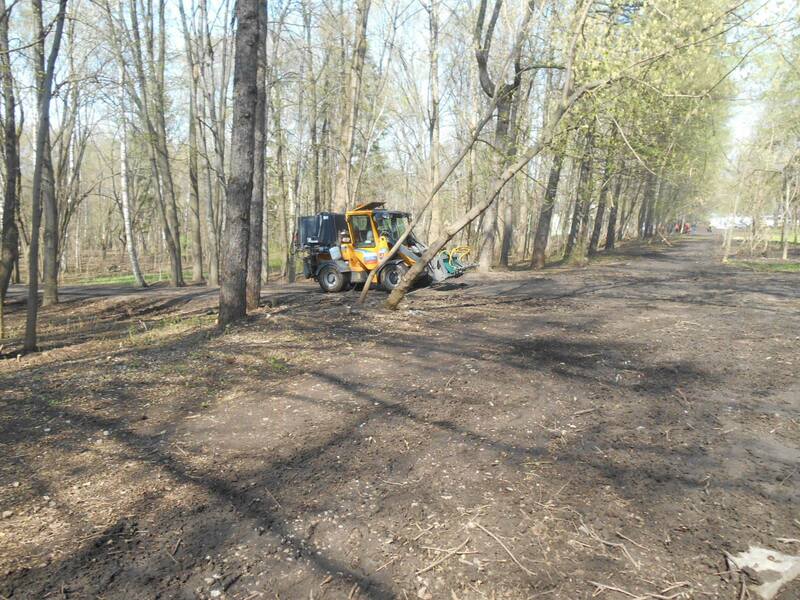 Construction company ‘MAGNUM’ (‘МАГНУМ’) that won the construction tender have started the works in the MSU Park. Those are just first stages. 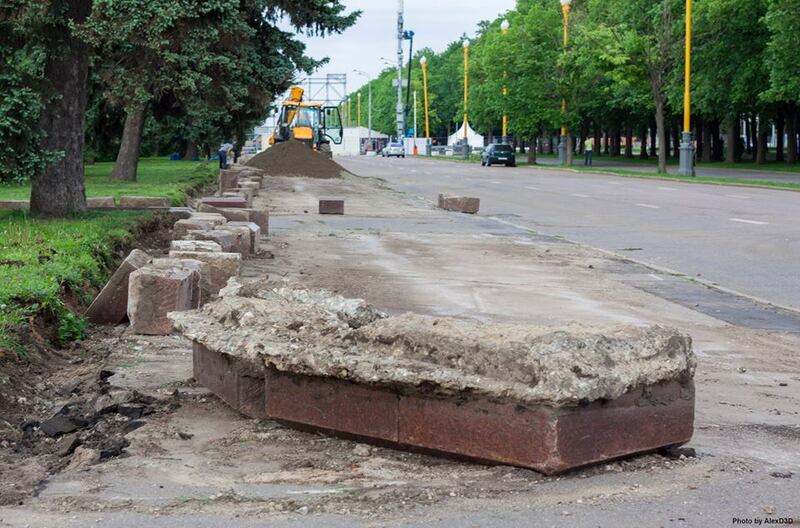 In the MSU park, more known as the “big lawn of MSU” (Большой газон МГУ), a massive logging (tree cutdowns) has just started as a preparation for the World Cup. Today’s “Big lawn” is a mess of the earth, leftovers from tractors, and chopped branches and bushes. 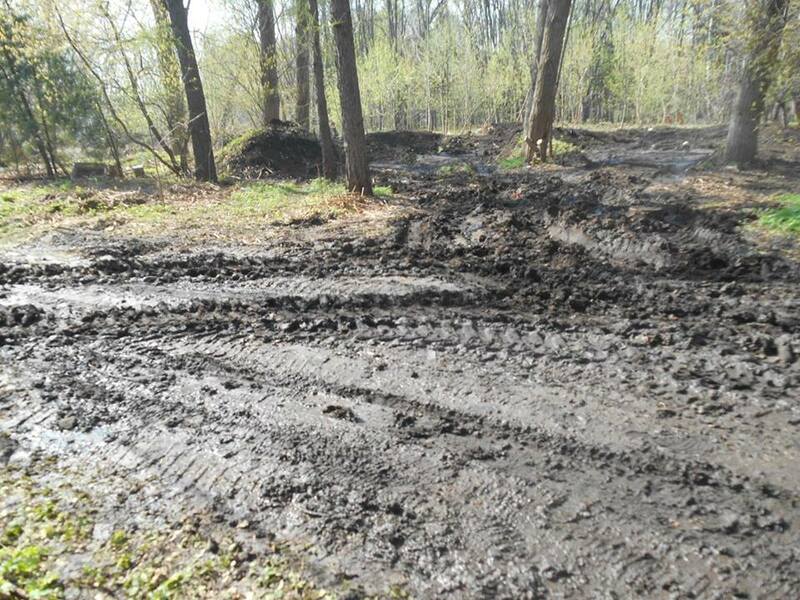 It is clear that this work was done on an urgent basis, and the workers did not bother to minimize the damage to the nature of the park. 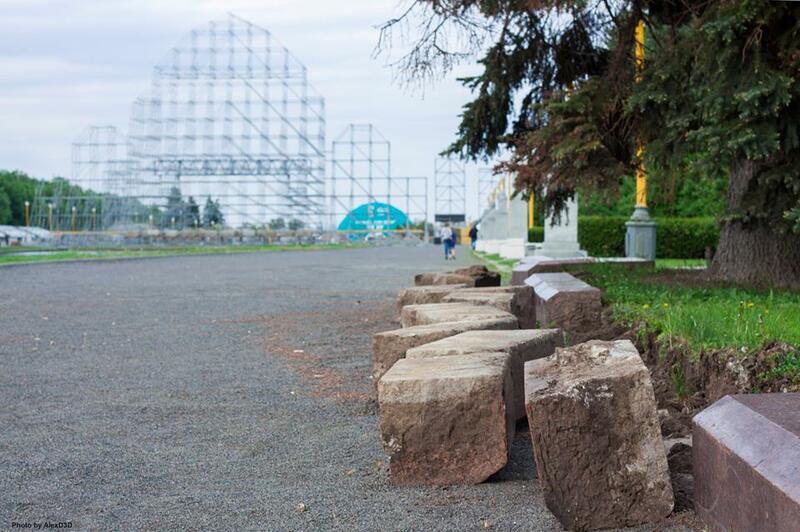 As reported by workers, bushes and trees are cut down for the “protection against maniacs” that can harm the guests of the fan zone of the World Cup, and this is a personal order of the prefect of Western Administrative District Alexey Alexandrov. Meanwhile, there are endangered species of birds having nests in these areas. The cutting of the bushes is to lead to the destruction of the nests and the death of the young birds. Formally, this park does no longer belong to the territory of MSU: in 2013, Rector Victor Sadovnichy transferred the territory to the Gorky Park (‘Парк Горького’) . 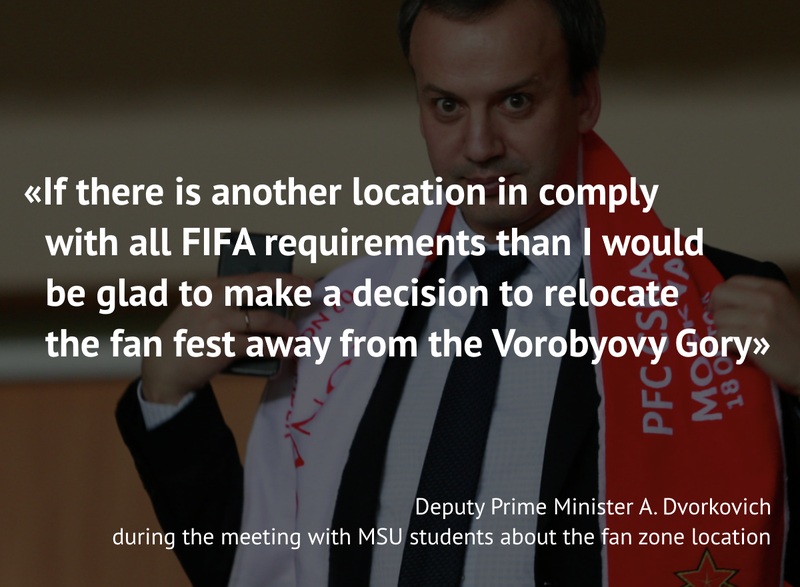 Let us remind you, previous Head of World Cup Organisation Committee Alexey Sorokin and Deputy Prime Minister Arkady Dvorkovich solemnly swore that the MSU will not be damaged by the fan zone. Same promises were made by all local authorities involved in the organisation of the event. 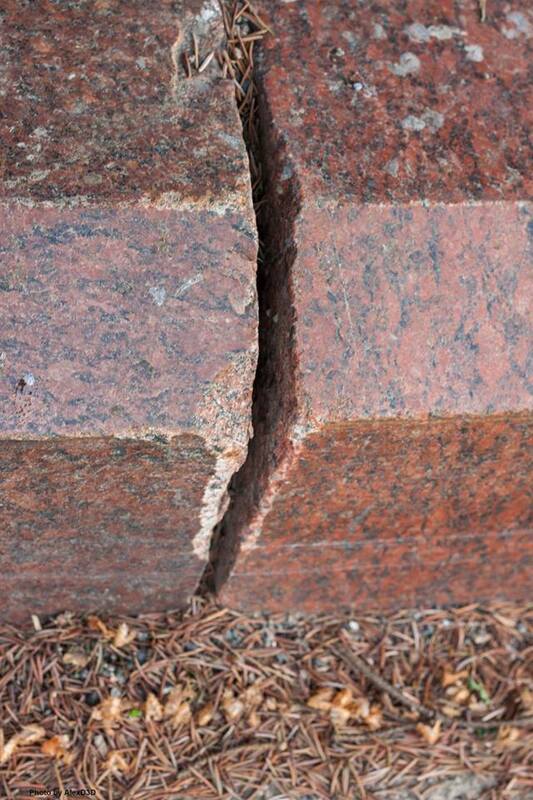 This is not the only damage that the MSU has already received within the preparation stage for the championship. On 22 April, the deputy director of the Botanical Gargen of MSU, Alexander Rappoport, spoke about an attempt by state services (ГБУ «Автомобильные дороги ЗАО») to knock down trees located in the Botanical Garden of the MSU. 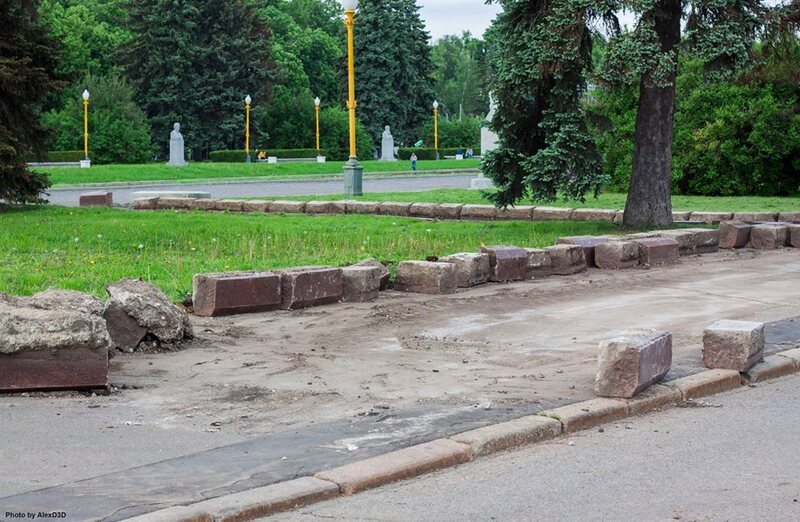 Vice-Mayor Petr Biryukov has issued an urgent order to repair the old fence of the University, despite the fact that the Botanic Garden is the object of cultural heritage, and any unauthorized logging is not only prohibited but also is a criminal offence. MSU employees have managed to stop illegal logging, but nobody knows for how long. The situation once again confirms: one cannot believe the empty assurances of officials even if they hold positions in government or committee. The stories of ” University advertising “, ” lack of noise “, ” Soundproofing ” and ” minimizing inconvenience ” actually turn into new rounds of destruction. The Fan Zone should be moved as far away from the University as possible. 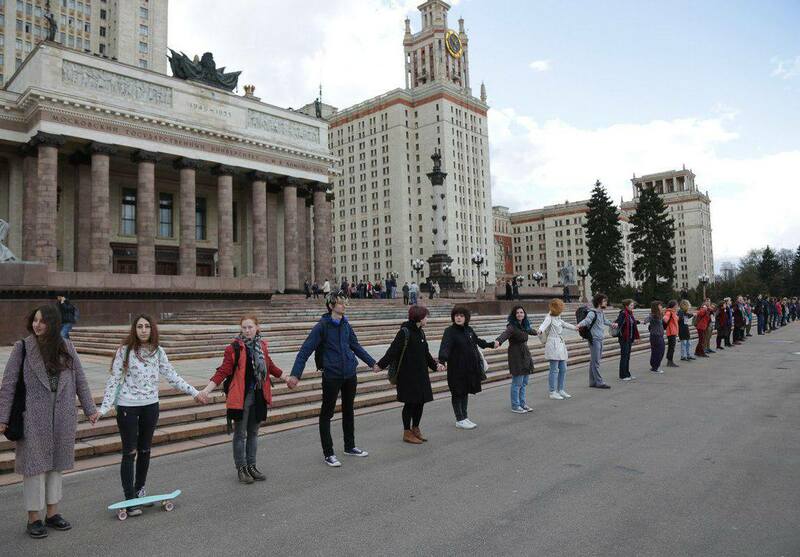 On the afternoon of 28th of April students of Moscow State University (MSU) and High School of Economics (HSE), as well as the other universities along with professors and locals, joined their hands to form a 300-meters long human chain in front of the main building of MSU to protect the university from the humiliation of the FanFest. We are grateful to the authors of the idea of the action and to all who came — this is an impressive gesture of solidarity and a signal to officials: the academic community will not silently tolerate neglection of the interests of education and science and defying students opinion. There were several police cars in the area since this morning, and the internet has been shut down during the action, including mobile service (cellular repeaters of several mobile operators are located on the steeple of the main building of the MSU). 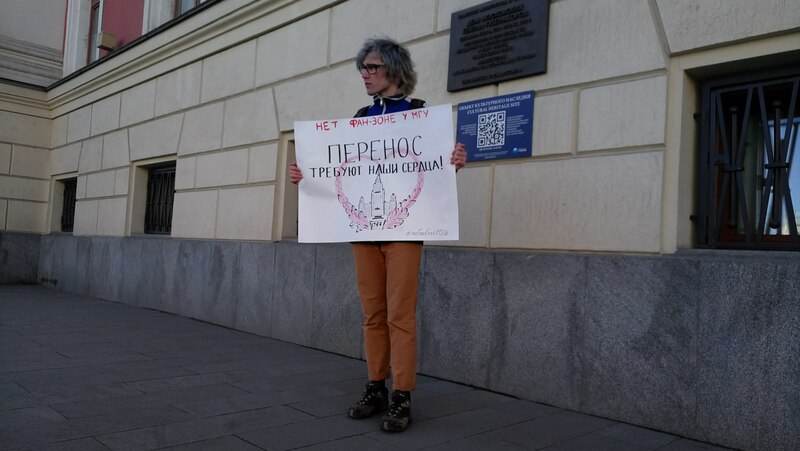 Police, plainclothesmen and the provost of MSU Alexey Stepanov demanded students to leave immediately due to the “concert for veterans” holding at the main building of the MSU. However, the only sign of a concert was the patriotic music coming from speakers on the porch of the building, but without any participants. Overall, it went peacefully, no one was detained. The fight to relocate the fan zone (Fan Fest) continues! Students and employees of MSU are fighting to relocate the FIFA 2018 World Cup Fan Festival fan zone away from the Sparrow Hills for almost a year — since May 2017, when the initial plans for the location were released. 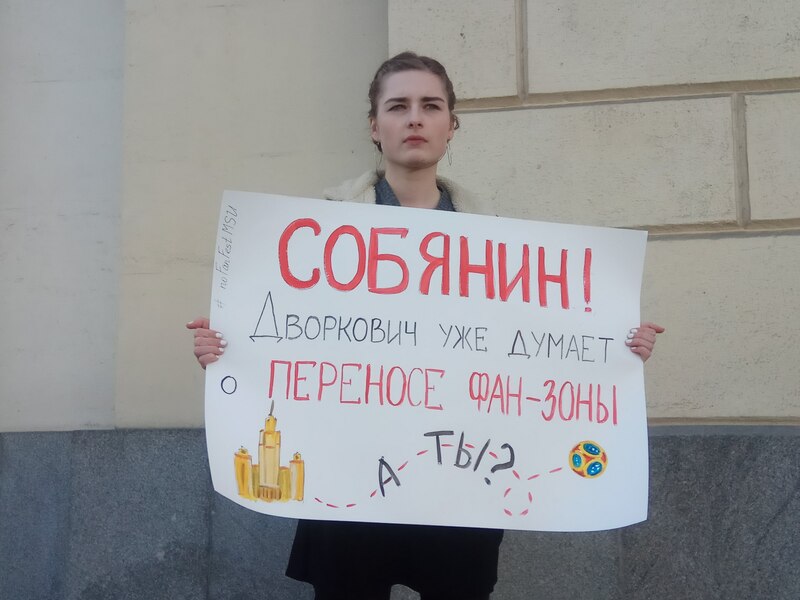 During the summer and autumn of 2017, students started with lawful appeals to all possible state institutions, and in February 2018 the started a protest. The campaign is coordinated by the Initiative Group of students and employees of MSU (IGMSU). Started to spread the info about the issue and the protest in English: made a website, posted news on social media, gave several interviews to major European media. Head of the organising committee for FIFA World Cup 2018 Arkady Dvorkovich made a comment to the media that he agreed on the location of the fan zone with the students. That is not true. Our position is very strict: fan zone should be not be located on Vorobyevy Gory or anywhere near the Moscow State University. Dvorkovich, Deputy Prime-Minister, said he will ‘search’ for alternatives during the meeting with students and that was the only that was agreed on (we have the audio record of this meeting). Neither 300 metres away from the Main Building nor any other option near the University is not appropriate for us. Everything related to an agreement about fewer fan capacity or plus 300 metres from the University is absolutely untrue as well. This is not our demand and this plus 300 metres were already included in the initial plan. 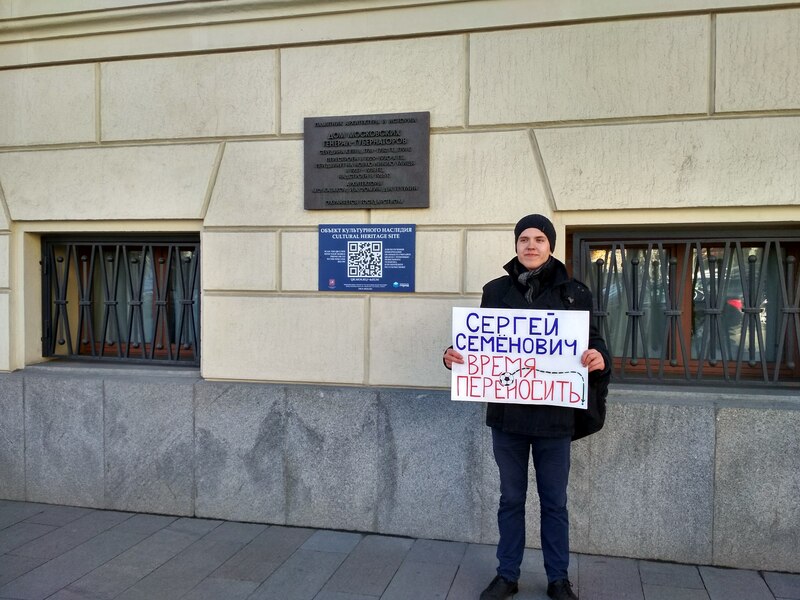 Today we protest near Moscow mayor’s office today and also submitted our petition to relocate the fan zone that 14 thousand people already signed. 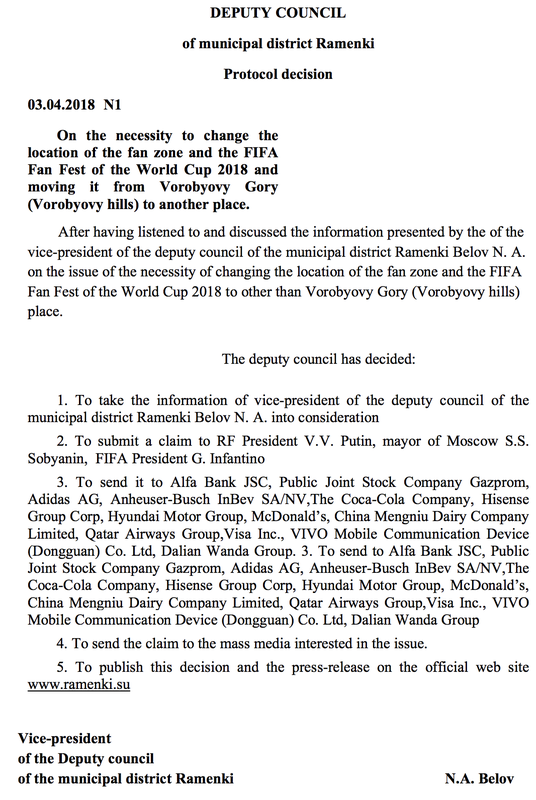 On the 3rd of April 2018, the Deputy council of the municipal district Ramenki considered the issue of the necessity to change the location of the fan zone and the FIFA Fan Festival of the World Cup 2018 from Vorobyovy Gory (Vorobyovy hills) to another place and decided to submit a claim to President V.V. Putin, mayor of Moscow S.S. Sobyanin, FIFA President G. Infantino and all the major sponsors. 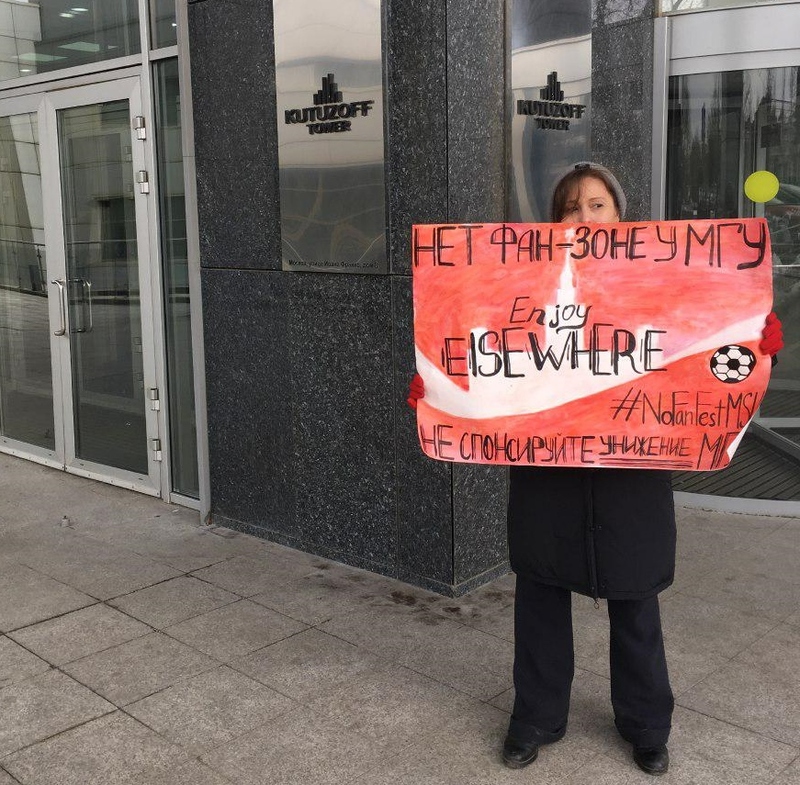 On March 26, students and alumni came with placards to Moscow headquarters of the FIFA sponsors. They protest against organizing FIFA Fan Fest right next to their university. 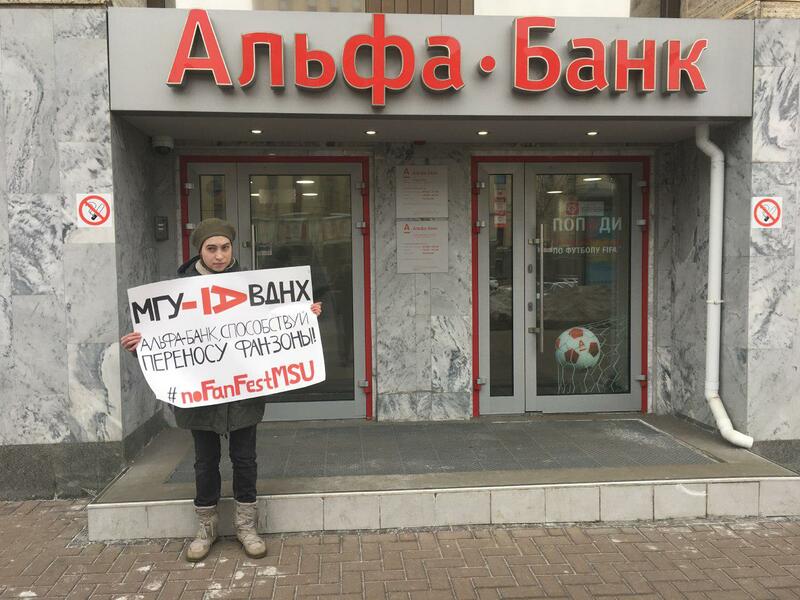 The Moscow State University community urges to change the location of the FIFA Fan Fest that is currently planned right next to the Main Building of MSU. The massive event for 25 thousand fans threatens the educational and research processes as well as the 6, 5 thousand inhabitants of the dormitories. “Enjoy elsewhere” “MSU without Fan zone – I’m loving it” “Nothing’s impossible? 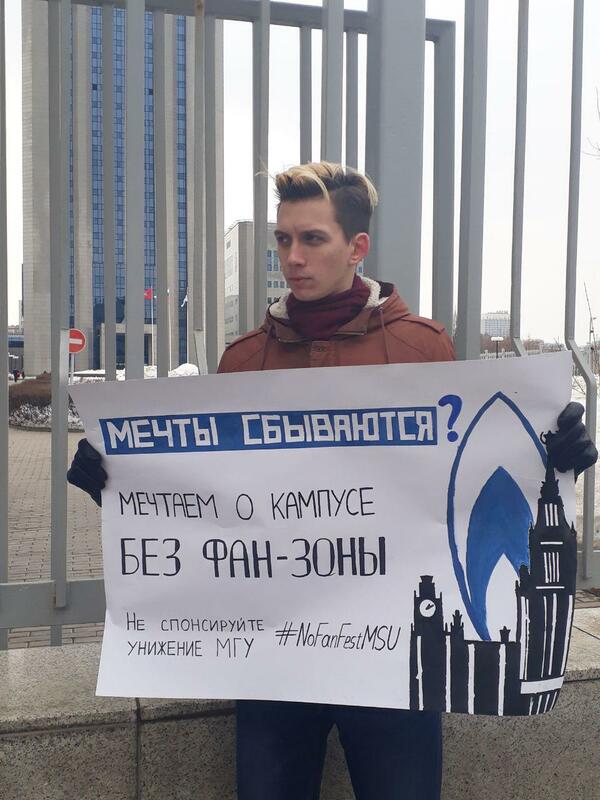 Can you take the fan zone away from MSU?” — those were the slogans of the pickets in front of Moscow headquarters of FIFA sponsors. The Initiative group of MSU sent letters to 10 FIFA sponsors. The group emphasizes that using the University building as a commercial decoration and ignoring the opinion of the community is bad publicity. The Festival near campus “will cause the discontent and may provoke the students’ protest actions”, — warns the letter. 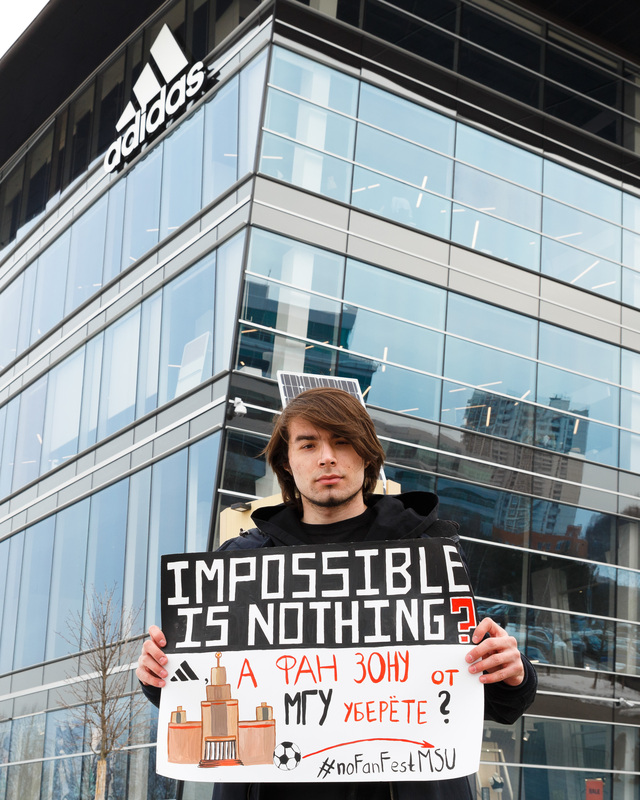 6 protest pickets took place in front of Moscow head offices Coca-Cola, Adidas, McDonald’s, Visa, Gazprom and Alfa-bank. No executives came to talk with the protesters, however, the employees who heard about the issue for the first time showed spontaneous solidarity agreeing that university campus is surely no the place for the festival. The Initiative group has already appealed to the FIFA President Gianni Infantino and the FIFA Ambassadors but got no answer. 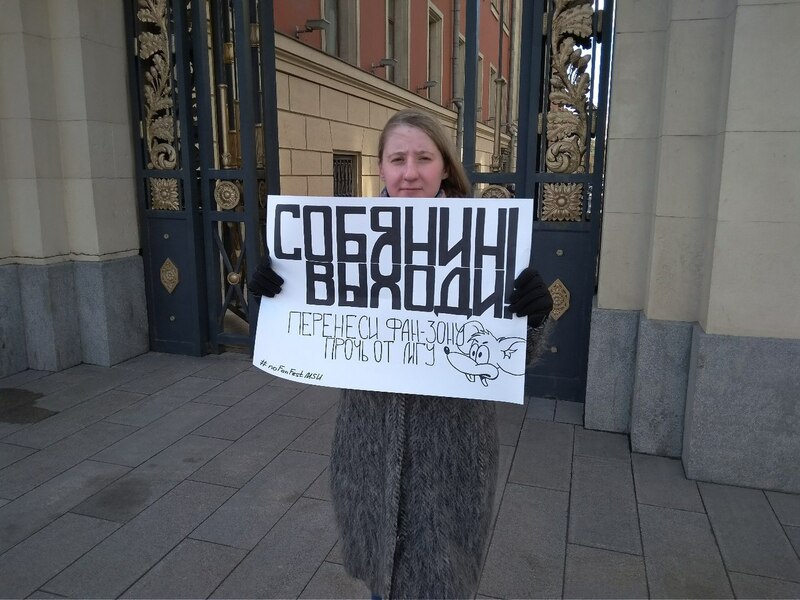 Over 4, 5 thousand paper signatures were left at the offices of MSU President V. Sadovnichy, V. Putin’s Administration and mayor’s office this February. The initiative group says they will continue to protest and fight until the location of the fan zone will be changed. “The current location is a humiliation to the whole academic community”, — say the students and alumni.